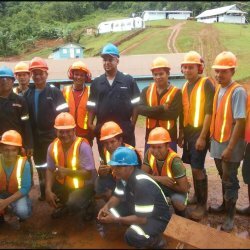 VANCOUVER, WASHINGTON, CANADA, August 3, 2018 /EINPresswire.com/ — Guyana Goldstrike Inc. (the “Company” or “Guyana Goldstrike”) (TSXV: GYA,FSE:1ZT) is pleased to report initial assays from Trench TTR-18-6 at the Toucan Ridge area on its Marudi Gold Project ("Marudi" or the "Property") located in the Guiana Gold Belt, Guyana, South America. A total of 90.40 metres was trenched in TTR-18-6 and 33 samples were taken for fire assay. 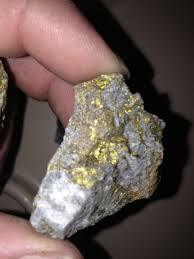 Of these, eight were re-assayed for total metallic content with results returned as high as 1.53 g/t gold. In May 2018, trenching samples from the Paunch area returned the trenching program’s first significant gold discovery with high-grade assay results of 5.98 g/t and 7.45 g/t gold over 2 metres respectively. The initial area of trenching at Toucan Ridge began on the western end with trench TTR-18-05 which is located approximately one kilometre east of the Marudi North zone and one kilomtetre north of the Mazoa Hill zone. 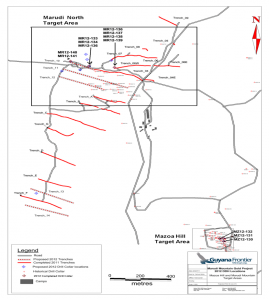 The Mazoa Hill zone contains the project’s current mineral resource estimate: 259,100 indicated gold ounces within 4,428,000 tonnes grading 1.8 grams/tonne (g/t) and 86,200 inferred gold ounces within 1,653,000 tonnes grading 1.60 grams/tonne (g/t). The Toucan Ridge area of interest continues for more than 1.75 kilometres to the east of the first trench – TTR-18-05. Trench sites are planned along the length of the ridge where quartzite-metachert is exposed or interpreted to occur beneath the transported overburden. The eastern part of Toucan Ridge is approximately 400 metres south of the Paunch area which was trenched in May of this year and returned the Company’s first significant gold discovery and approximately 350 metres north of alluvial workings at Toucan Creek.